Have a pair of worn-out kicks that are one step away from dumpster heaven? Teach those old shoes some new tricks with the Solar Street Light Kit from Lost Values. Originally an exhibition piece by the Scottish design firm, these Stride Rite-meets-Lite-Brite solar lamps were inspired by “Shoefiti,” the baffling practice of flinging shoes onto overhead cables. 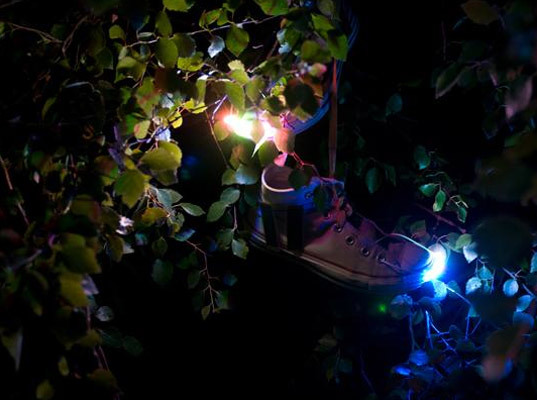 Using the included solar cells and LEDs, any set of sneakers can be quickly finessed into surreal garden or street lighting. The kit comes in two sizes—kid and adult—and is available with white or colored (“mood-changing”) lights. Toss one on the ground to illuminate the doorway of your home at night, or fling a pair into a tree—in the spirit of shoe-tossing—to puzzle passers-by. Have a pair of worn-out kicks that are one step away from dumpster heaven? Teach those old shoes some new tricks with the Solar Street Light Kit from Lost Values. 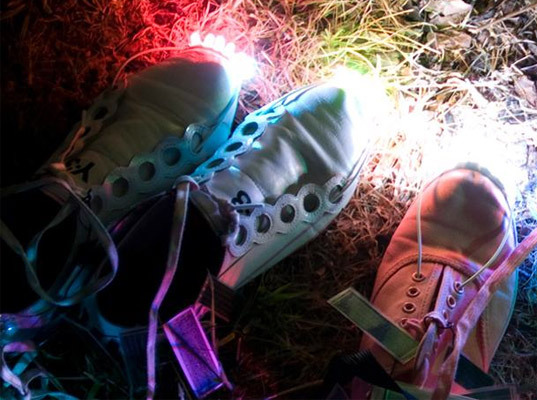 Originally an exhibition piece by the Scottish design firm, these Stride Rite-meets-Lite-Brite solar lamps were inspired by "Shoefiti," the baffling practice of flinging shoes onto overhead cables.